Here you will find all the things we want to write about. As we start writing more and more you'll see reviews and articles about the things we're playing and doing or wanting to vent or talk about. 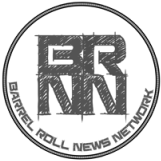 For now, enjoy Barrel Rolls, where Nick weaves a tale, once woven by Graham and the rest of Graham's Warhammer RPG group. Nick documents the adventures of Guldor the Dwarf as he travels with many other adventurers through an epic world created by Graham and the Warhammer RPG Rulebook.